Beginning on May 2, 2014, The History Center in Tompkins County, in partnership with the Bob Moog Foundation, will open the exhibition Switched-On: The Birth of the Moog Synthesizer. Illustrating the story of Dr. Robert Moog and the creation and evolution of the groundbreaking electronic instruments bearing his name, Switched-On: The Birth of the Moog Synthesizer provides museum visitors with a wide-ranging, interactive insight into Dr. Moog’s inventions and the creative process behind their design and development. Based on original interviews with family members, colleagues, and contemporaries, including Herb Deutsch, Bernie Worrell, Bill Hemsath, Don Preston, David VanKoevering, Shirleigh Moog, David Borden, and many more, the exhibition provides an unprecedented view into the creative genius of Bob Moog, one of the premier pioneering synthesizer inventors. 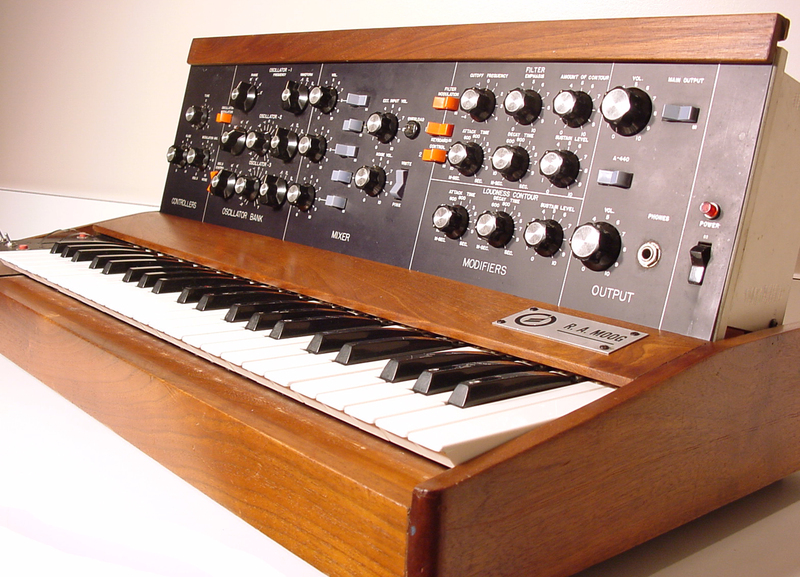 A rare R.A. Moog Co. Minimoog, one of the first 100 ever made. Photo by Roger Luther. Featuring a plethora of rare Moog instruments such as a 1950s R.A. Moog Co vacuum tube theremin, a Trumansburg-era Minimoog, and one of only three R. A. Moog, Co. PMS-15 amplifiers ever sold, Switched-On: The Birth of the Moog Synthesizer will be the first major exhibition on Bob Moog and Moog Synthesizers to occur in the region, and will run through May 31st, 2015. 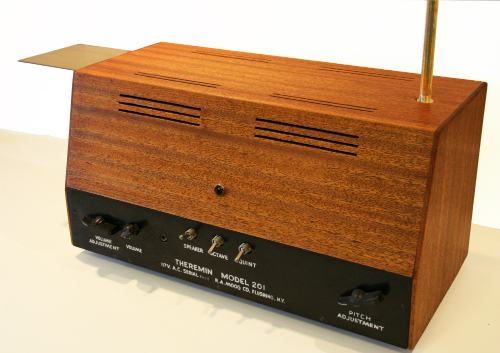 The ninth theremin Bob Moog ever made, built when he was a 20-year-old inventor living with his parents. Photo by Roger Luther. Also featured in the exhibit are host of rarely seen photographs of Moog’s young family as well as scores of schematics from the earliest iteration of the company. Robert Moog came to Ithaca, NY in 1957 to begin his PhD work at Cornell University. He founded the R.A. Moog, Co. in the late 1950s, selling theremins and theremin kits throughout Ithaca. In 1963, Moog opened a storefront for his small factory in nearby Trumansburg, NY. It was there that the Moog modular synthesizer and the iconic Minimoog were born. The factory grew to become a mainstay in the region until Moog sold the company in 1971, and the new owners moved it to Williamsville, NY. Switched-On: The Birth of the Moog Synthesizer tells the story of Moog’s Trumansburg years, through the oral histories of those who knew him, worked with him, and shared his path in shaping a revolution in sound, technology, and music. This sounds like a really neat exhibit…not sure if I can get away to see it in Tompkins County, would be cool if it were in other cities too, perhaps in the Greater Detroit Area…. Sounds like a great exhibit…if you are considering bringing it to the Greater Detroit Area, I can help you organize it. Will be going up north at the end of the month – going to enjoy this to the max. Keep up the good work. All the best!! !